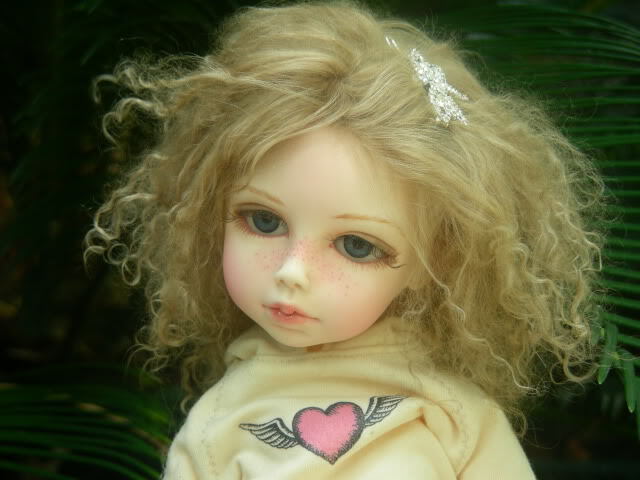 I am new to BJDs. I have looked for two years, but the more I looked, the more confused I got. When I saw pictures of sweet Anya and a friend of mine told me her size and how wonderful she was to pose I knew she was the one for me. Kim did Anya's special faceup for me and she is perfection in my eyes. I am totally in love with this little girl. I wonder if I could ever love another BJD as much as this one. Hee Hee, don't I sound just like a mother. I love her with the freckles!!!!!!!!! Jeanie, your Anya is really wonderful. Congratulations,you made a great choice for your first BJD!! Thanks for sharing your photos of this special little girl. Jeanie, if this is your first BJD, you REALLY got it right. I have Anya, too, and she is truly wonderful. I think she's perfect. I love the freckles on your girl. She is just adorable! SO sweet! What wonderful photos, too. Thanks, Kim, Karen and Alison. I am still over the top with my Anya and am thinking about Kim's new 23" Alice. I'd love to see her next to Anya for size though. I adore this littel girl! I love her faceup and her hair! Who did the face up?